Castello di Casole - A Timbers Resort, is a historic 4,200-acre private estate located in the heart of Tuscany. Perfectly centralized between the cities of Florence, Siena, San Gimignano, and Volterra, the estate encompasses vineyards, olive groves as well as a designated model game preserve. Two grand cypress-lined lanes ascend to the historic castle, which is now the 41-suite 5-star boutique hotel. The hotel has an incredible destination spa and fine and casual dining options in three unique venues. The estate is completed by an offering of private villas and farm homes perfect for larger groups and multi-generational family travel. 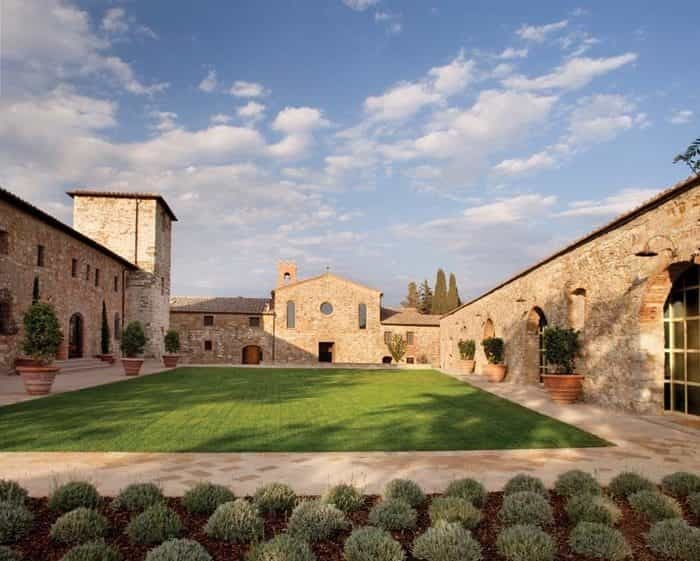 Castello di Casole graced the cover of Conde Nast Traveler’s January 2014 issue and was recently ranked the #1 Resort in Europe by Travel + Leisure readers for the second year in a row. Every visit to Castello di Casole should surprise and delight, shake us from our regimen and enliven the spirit in new ways. There is a pond for reflecting, terraces for sunning, fountains to inspire, courtyards for dining and paths for immersing oneself in the year-round glory of Tuscany. Amidst the special places and moments, you will enjoy remarkable amenity offerings that enhance each experience from the collection of fine and casual dining venues to the serene reprieve found at Essere Spa. With food, drink, and rejuvenation as essential parts of everyday at Castello di Casole, there is little left to be desired. Castello di Casole is an enticing and spectacular venue for weddings, in part by virtue of its many unique and memorable gathering spaces. There are spacious lawns, terraces, an intimate chapel and an amphitheater for open-air celebrations. Dining in the restaurant or on the glorious seasonal terrace can be arranged and themed for the event. Attending to every detail, a team of bilingual and seasoned event planners will help see to every detail. Simply ask, and consider it done. Venue Capacity: Historic Chiesa S. Tommaso Church, newly restored to host intimate gatherings and celebrations for up to 30 guests. For larger events with up to 200 attendees, a picture-perfect ceremony among the vineyards or in any of the pristine outdoor spaces. Accommodation: Hotel Castello di Casole offers 41 luxurious hotel suites in a range of styles and sizes to accommodate visitors in grand style. Dining Options: Castello di Casole, a luxury resort and hotel in the heart of Tuscany, offers remarkable dining experiences, a collection of fine and casual dining venues serving traditional Italian cuisine with a twist. Swimming Pool Whether you want to swim, soak or splash, the pool terrace at Castello di Casole is a fun place to enjoy the fresh air and beautiful sights of Tuscany. Spa At the heart of the hilltop estate on a quiet pedestrian path is our inviting Essere Spa. Originally the estate’s wine cellar, the Spa offers a serene setting within one of the most dramatic spaces on the property. Why Own with Timbers Resorts?